From cactus to aloe, drought-resistant succulents come in an amazing variety of shapes and colors. This variety, and the fact that they're easy to care for, make succulents the perfect plants for everything from a tiny planter on the counter to a lavish outdoor display—and all the creative displays featured below. Megan Andersen-Read stuffed snail shells with cuttings of various small succulents that had begun to root, and then added just enough potting soil around those roots. She had enough shells that she was able to put some of these gardens around the house and more outside as accents for her larger garden. It's hard to throw out obsolete books, but it may be easier to turn them into something pretty, like a miniature garden. Instructables member loveisinmytummy found this project to be easier than it looks. You hollow out the pages and build the garden of your dreams in tiny form. The accessories are optional; use your imagination to create the literary world you want. We expect fresh greenery on a Christmas wreath, but a wreath of live flourishing succulents is a lovely celebration of warm weather. Stephanie at Garden Therapy shows you step-by-step how to make your own succulent wreath, whether fully planted like the one shown here, or partially-covered. She also teaches you how to care for it, and how to refresh your wreath when the plants begin to show their age. To freshen up a space that's too small for a wreath, how about a simple succulent ball? Instructables member marcellahella will help you create a little garden ornament that can go anywhere, and even move around to take advantage of different light and temperature conditions. There's no reason why your backyard fence or garden wall shouldn't have its own artwork. Vertical gardening goes in a picture frame to display outdoors in this living painting project from Instructables member algert555. Once you have your framed shadow box built and loaded with soil, the fun comes in artfully arranging different succulents to create your masterpiece. Does your refrigerator get sunshine? If not, there must be some metal surface in your home that does. Instructables member AlexeyY4 offers a tutorial on putting living plants in wine corks that you can stick on a metal surface and move around as you see fit. 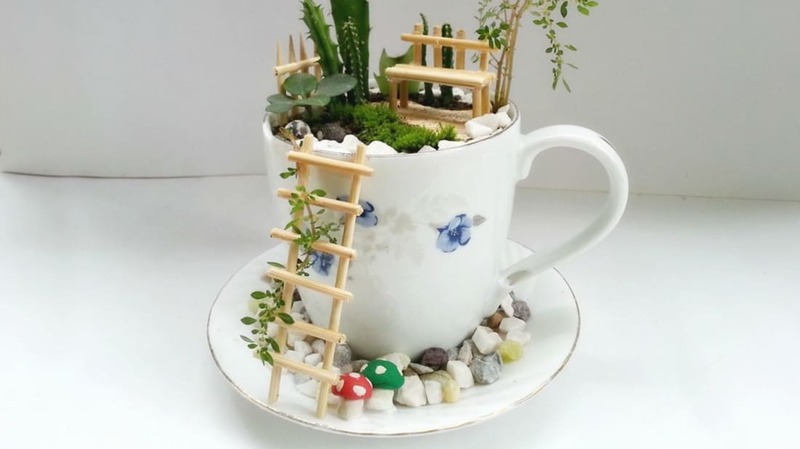 Isn't this charming—a miniature living diorama in a teacup! Muhaiminah Faiz made this one and gives us all the steps to create it and the accessories at Instructables. How many times have you seen a nice chair abandoned in the street because the seat was broken or missing? Instructables member DIYwithCaitlin rescued an old chair frame to make a lovely planter filled with succulents. If you have plants on the ground and hanging plants, this idea gives you an intermediate level to balance the visuals on your porch or in your garden. Succulents look great in a metal chair as well. Succulents can survive well enough as to be wearable for your wedding or other special occasion. Susan McLeary at PassionflowerMade will make custom necklaces, crowns, bracelets, and more composed of living succulents. After you wear them, they can be transplanted to soil to serve as a cherished souvenir. And if you have a gentle hand and patience, you can make your own succulent rings and earrings with instructions from Succulents and Sunshine. If the conditions are right, you can wear succulents for a long time. They can be small enough to fit into a jewelry-size terrarium and stay green for years, with proper care. Boobooplant sells them in tiny terrariums that you can wear as a necklace, keychain, or pendant. Megan Andersen-Read knows you can display succulents in anything, if you keep your eye out for possibilities. Even pine cones! Read her tutorial on how to build a hanging succulent garden in pine cones at Creative Live. A year later, she says the plants in the pine cones are doing just fine. Andersen-Read has also placed succulent gardens in toys and even shoes! Since succulents can be tucked into tiny spaces and they don't need much water, they are the perfect plants to set into broken pottery. You'll find instructions for building a broken pot succulent garden at MidwestLiving. Bricks aren't something you'd normally put on your dinner table, but as a planter for attractive succulents, they make a nice centerpiece, with or without candles. Arianna Thomopolous shows us how she carved holes in red bricks to make one for Mother's Day. Those planters will last forever.